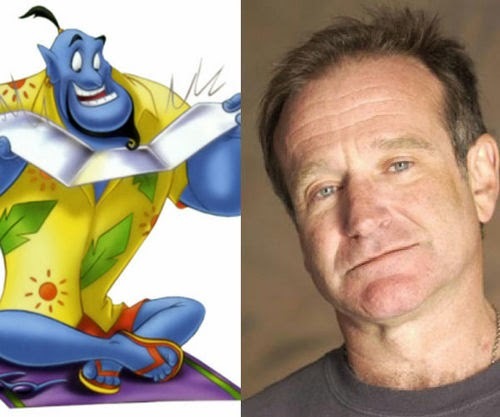 Robin Williams as the Genie in "Aladdin" - Whoopi Goldberg also did this character, but Robin Williams is the gold standard. He re-ignited the trend of getting A-List figures in Hollywood to voice animated characters during Disney's Renaissance of the 1990s. There are so many top voice talents that have voiced memorable animation characters - many of them long forgotten except by fans - that it is almost an injustice to try to list the top ones. However, it is nice to know who voiced some of the more popular characters in animated feature film history. Off the top of our head, did you know that Bing Crosby ("The Adventures of Ichabod and Mr. Toad"), Jerry Seinfield ("Bee Movie"), Vincent Price ("The Great Mouse Detective"), Bob Newhart ("The Rescuers" and "The Rescuers Down Under"), James Woods ("Hercules") and Walt Disney himself (he did Mickey Mouse for many years and even appeared as himself in "Saludos Amigos") voiced popular animated characters? And many, many more famous names, way too many to list. Because there is no point in honoring only the top celebrities - they get enough homage as it is anyway - we will include some of the lesser known characters and the actors who brought them to life. So, without slighting anybody, and all omissions being without malice, let's go through a few. For a decade Walt Disney insisted that the identities of the actors and singers providing the voices for his characters were kept secret. He believed that if audiences knew who was providing the voice the magic would be ruined. As a result, the entire cast of Disney's first feature film Snow White and the Seven Dwarfs went uncredited – along with the several other movies that followed. The title role was played by Adriana Caselotti, an 18-year-old Italian who was trained by her father to be an opera singer. Disney personally chose her for the role and she was placed under a contract which forbade her from appearing in film and other media. 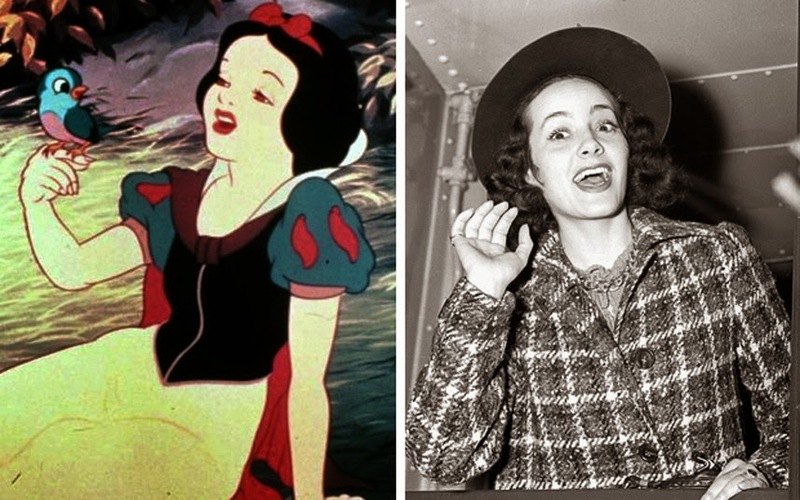 However, she continued to take part in publicity for Snow White until well into her later years. Adriana Caselotti was up in her bedroom and heard her father, one of Walt Disney's cronies, talking about finding just the right girl to voice Snow White in Disney's upcoming ground-breaking animated feature film "Snow White and the Seven Dwarfs." She came down and wowed Walt, who loved her voice and style and quickly cast her. Adriana suffered from the system at the time - that essentially was her only role of any note - but she goes down in history as the first true voice star of animation. 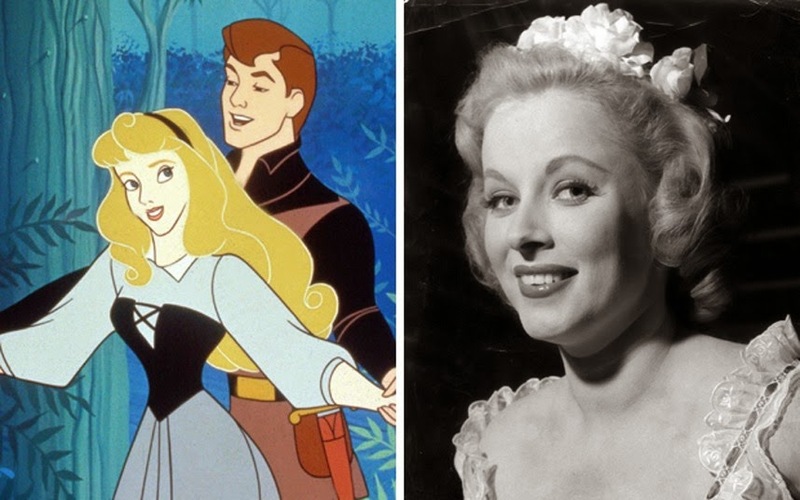 Mary Costa is one of the unsung heroes of animation. "Sleeping Beauty" was a financial disaster upon release - it just seemed a little too like every other Walt Disney animated feature film - but in hindsight, it has become hugely popular, spawned a live-action remake/retelling focusing on villainess Maleficent starring Angelina Jolie, and generally been acknowledged by virtually everyone as a high point in the entire history of animation. 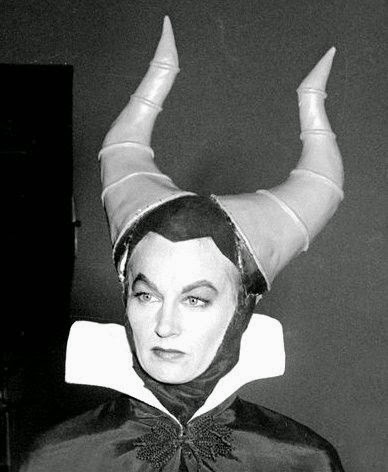 Since we are on the subject of "Sleeping Beauty," there is no point in slighting the wonderful Eleanor Audley in the key role of villainess Maleficent. She was the first to don the horns, and while she did not portray the character on screen herself, she had no problem dressing up as the character to help the animators track her characters movements for the film. 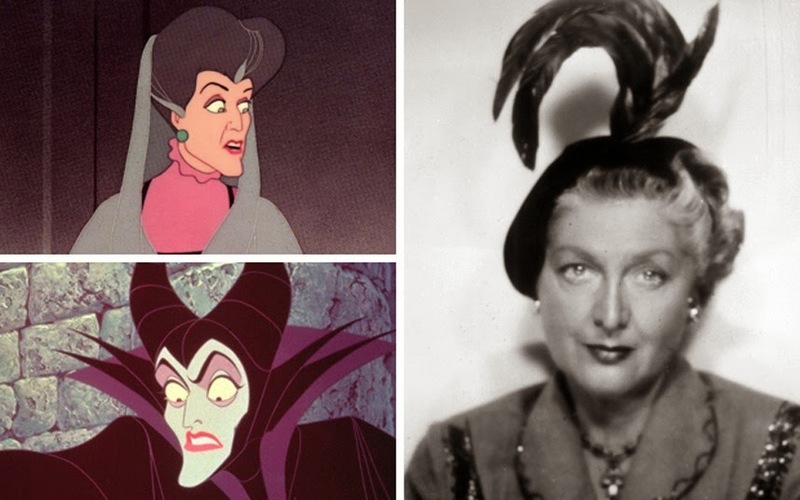 If there ever is a Hall of Fame of voice actors, Eleanor Audley needs to be in there. Oh, and if you're true fan of animation legends, you had to know that I wouldn't skip the fact that Eleanor voiced Lady Tremaine in "Cinderella," too! Talk about being in two of the top classic animated feature films of all time! 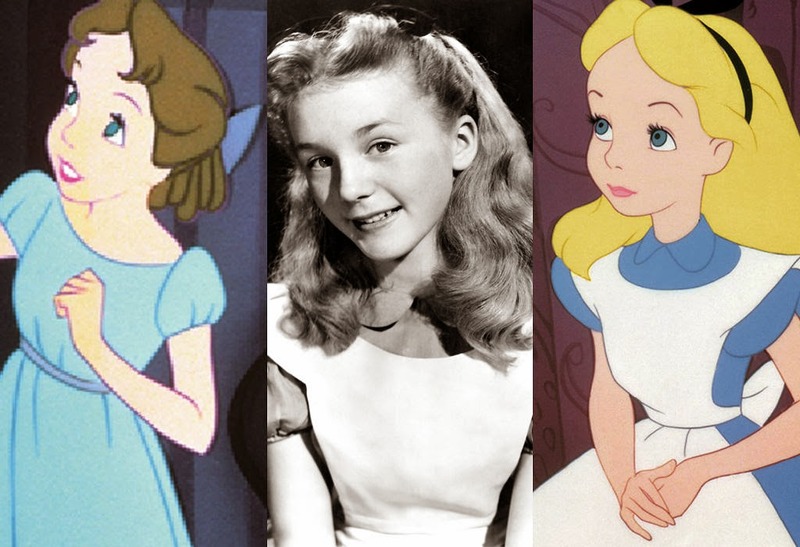 Alice in Wonderland (1951) and Peter Pan (1953) Wendy/Alice — Kathryn Beaumont At just 10 years old Kathryn Beaumont was both the voice and model for Alice in Disney’s original 1951 animated "Alice in Wonderland." She went on to be the voice for Wendy in "Peter Pan," and today continues voice work reprising her famous roles. The 75-year-old Beaumont also worked as a schoolteacher where she was known to delight her students by performing her Wendy and Alice voices. Anyone who does not include Kathryn Beaumont, who voiced Alice in "Alice in Wonderland," in their "Legends of Voice-overs" list needs to sent down the rabbit hole! Kathryn Beaumont has one of the most incredible stories in Hollywood history. She had a slight British accent because she was a native of Great Britain, and Walt Disney loved that fact - along with her girlish ten-year-old personality and bright, blue eyes She was the Honey Boo Boo of her day! Kathryn was still kind of hanging around the studio afterward completing "Alice," so Walt decided to use her again - in the little role of Wendy Darling in "Peter Pan." That doesn't happen too often in Hollywood. The best part about Kathryn's story, though, is that she successfully evaded the curse of child actors that struck down so many of her peers. Never one to get airs, she voiced two of the most famous characters in film - not just animation - history, and then just casually went back to school after her intern job at Disney completed when summer vacation was over one year. That is precisely how it went down, no more acting and no more voice work. She studied hard and became a schoolteacher, never looking back at former fame or riches. This girl was raised right. Many, many years later Kathryn came back to Disney and voiced her old characters again, long after everyone had forgotten who she was, recapturing the magic and no doubt making her former pupils honored to know they had had a brush with true Disney greatness. That is an awesome, magical story all in itself. Phil Harris was quite successful in the 1950s onward as a recording star and lounge singer, and some still remember him as the perennial host of a golf tournament throughout the 1970s. However, Harris also voiced, not one, not two, but three of the enduring characters in animated feature film history. He began his string with Baloo the Bear in "The Jungle Book," one of the most memorable Disney films of all time (and one that is being re-made as a live-action film at the time of this writing, too). It was the last animated feature film that Walt Disney himself oversaw, and he bestowed his blessing on Harris as Baloo, a role that helped turn "The Jungle Book" into the most successful Disney animated feature film since "Peter Pan." Harris then voiced O'Malley in "Aristocats" a couple of years later. In the advertising for this second film, Disney even slipped in images of Harris' character Baloo from "The Jungle Book" - despite the fact that Baloo was not in "Aristocats"! If that isn't the ultimate accolade for an unknown voice actor making an impression on audiences, well, there can't be too many better ones. The third character was as "Little John" in "Robin Hood" a few years later. By that time, Disney was falling on hard times in its animation department, and Harris had done his thing. He was a game trooper, though, and came back to try and voice Baloo again some twenty years later for a television series, but by that time his voice was gone and it just wasn't right. Harris remains virtually alone at the top of the heap by voicing key voices in three separate and unrelated Disney animated feature film classics. Probably the bigger voice star of The Jungle Book was Louis Prima, the lively musician who had reinvented his style through the decades – beginning with a jazz band in the Twenties, then moving on to swing in the Thirties, big band in the Forties, becoming a Vegas lounge act in the Fifties and forming a pop rock band in the Sixties. His performance as orang-utan King Louie and the song I Wanna Be Like You will always be remembered as one of Disney’s finest. 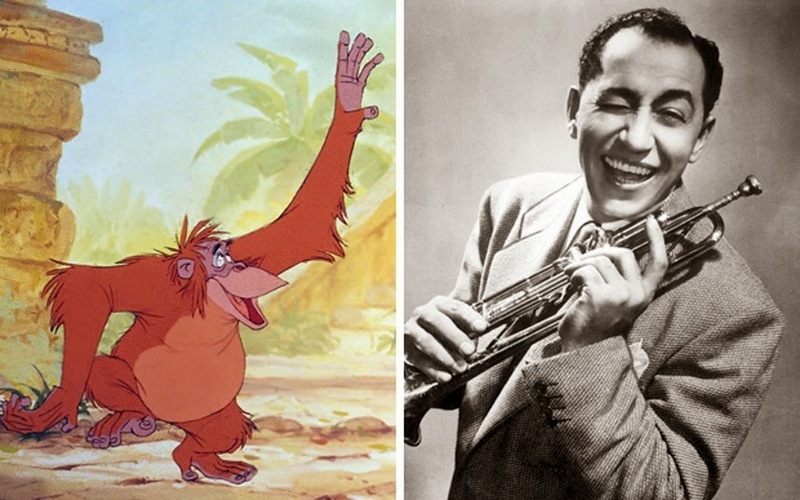 "The King of the Apes" was not supposed to be a major character in "The Jungle Book," but Louis Prima was so captivating in his performance that Disney expanded the role to suit him. 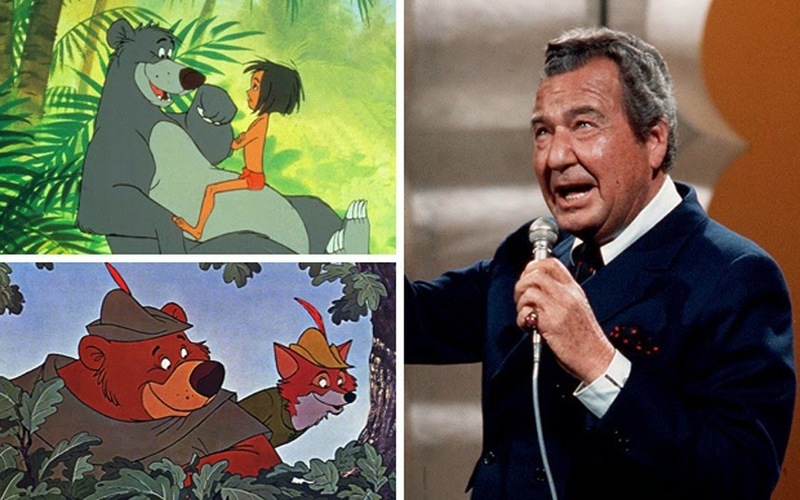 It was a brilliant decision, as most fans of the film will acknowledge that Louis Prima, aside perhaps from Harris as Baloo, was the best thing about "The Jungle Book." Terry-Thomas was one of the funniest men in the world, with his gap-toothed trademark grin, and he carried his talent over into the animation world with his portrayal of "Sir Hiss" in "Robin Hood." No, Sir Hiss was not in the original legend, and yes, it was a completely unnecessary addition that contributed to the feeling that Disney animation was descending to the level of television Saturday morning cartoons that were all the rage then. However, it is undeniable that Terry-Thomas lightened things up in what otherwise might have become a ponderous re-recitation of a story that everybody knows by heart. 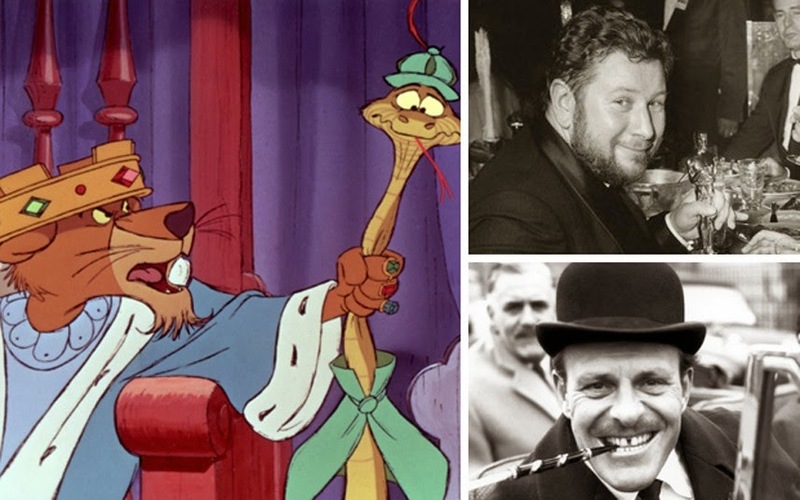 And let's not forget Peter Ustinov, esteemed Academy Award winner who pitched in to voice two characters in Robin Hood! "Who Framed Roger Rabbit" was an early Touchstone Films example of mixing live action and animation, something that Hollywood - which rarely invents anything new - is going back to with a vengeance these days in films like "The Smurfs." 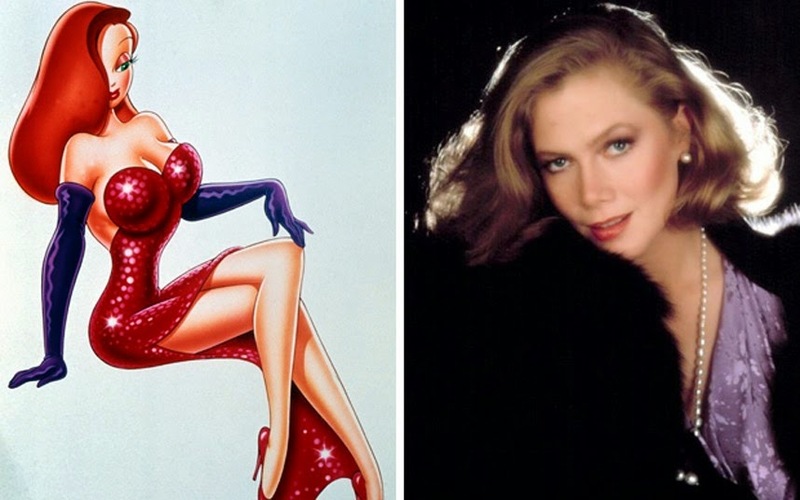 Kathleen Turner had a sultry voice that fit the voluptuous character of the Hollywood starlet. The character has become a staple of women's Halloween costumes ever since. 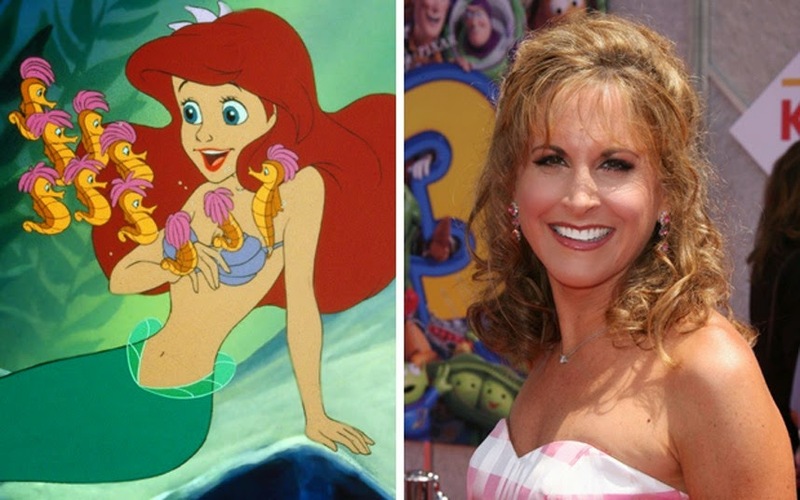 Jodi Benson has been in so many Disney animated projects that it is difficult to keep track. However, her most famous role was as Ariel in "The Little Mermaid," a role she reprised to great effect in the sequels. There is a special place in animation history for actors who take a small, insignificant role and make it their own. 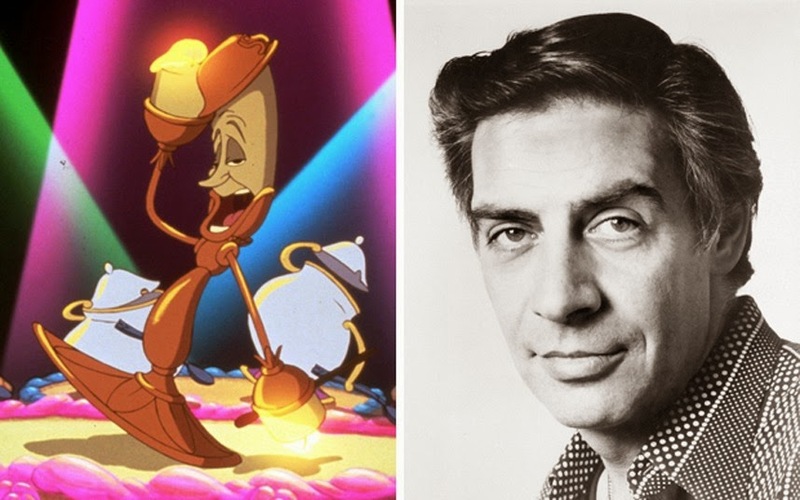 Jerry Orbach, star of "Dirty Dancing" and various television cop shows, did that with the role of Lumiere in "Beauty and the Beast." 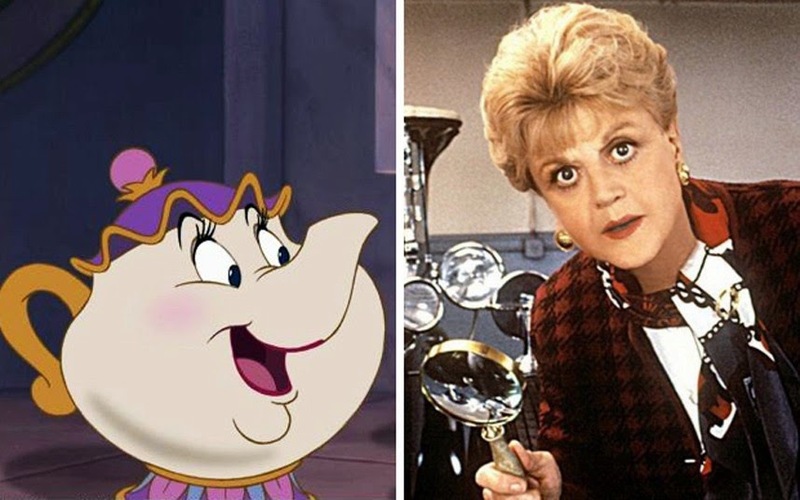 Angela Lansbury, so well known for appearing as Jessica Fletcher in Murder, She Wrote, was the voice of charming teapot Mrs Potts in Beauty and the Beast. Angela Lansbury was one of show business' legends when she took on the role of Mrs. Potts in "Beauty and the Beast," but she stepped up to the plate one more time and created a legendary character in one of Disney's most successful films of the Disney Renaissance. 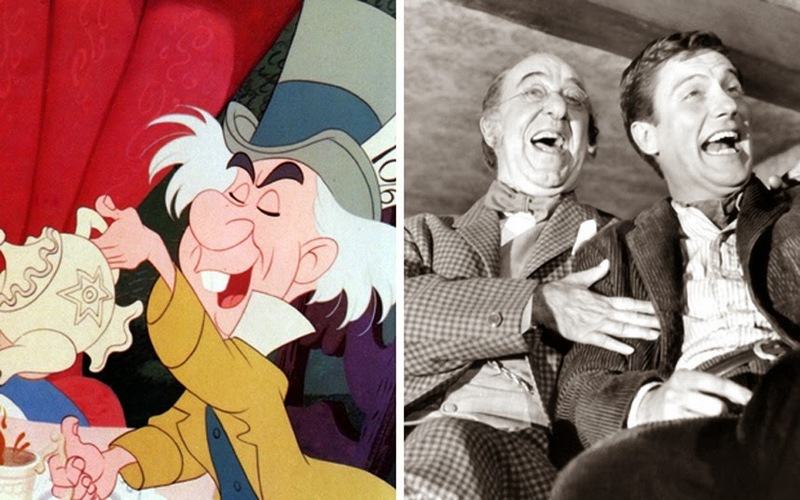 Ed Wynn is a familiar face best known for playing laughing Uncle Albert in 1964’s Mary Poppins and he also provided the voice for the Mad Hatter in Alice in Wonderland (1951). He was a successful vaudeville and comedy performer in the 30s before turning his hand to serious roles later in life – and earned an Oscar nomination for his part in The Diary of Anne Frank (1959). He was also originally offered the role of the Wizard in the Wizard of Oz but turned it down claiming it “too small”. He died in 1966, aged 79, and his epitaph reads "Dear God, Thanks... Ed Wynn". Ed Wynn was a popular character actor who performed his best role as Uncle Albert in "Mary Poppins," a fantastic fantasy role for which he was ideally suited. He also was The Mad Hatter in "Alice in Wonderland." That is perhaps the best combination of roles for a character actor in all of animation history. Sterling Holloway was an actor that Disney turned to time and time again. Those born in the first half of the 20th century may remember him as Uncle Oscar in the TV series the Adventures of Superman, however it is his voice that is best loved as that of Winnie the Pooh, Kaa in The Jungle Book, Mr Stork in Dumbo and the Cheshire Cat in Alice and Wonderland. 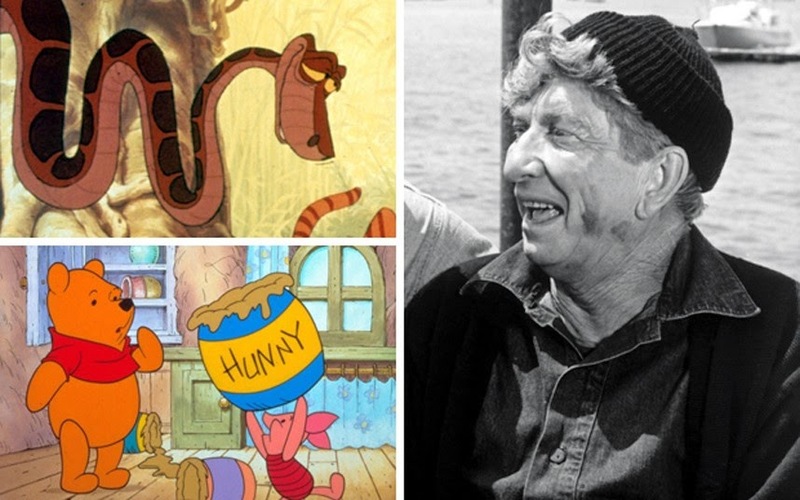 Sterling Holloway played a number of characters where you instantly recognize the voice, but not the name. Heck, you may not even remember the name of the snake in "The Jungle Book," but if you've seen the film, you remember both the character and the voice. Well, the name is Sterling Holloway, and he was one of the great talents in the voice business. 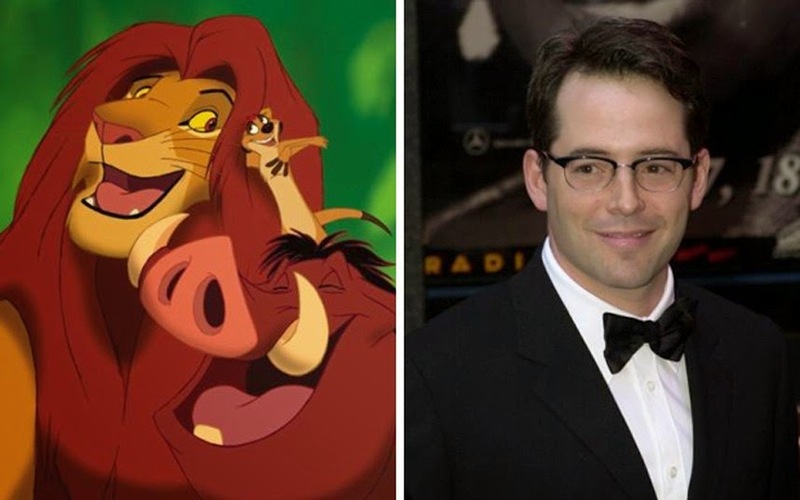 Matthew Broderick was famous as his signature character Ferris Bueller, but he created another legend by voicing Simba in "The Lion King," perhaps the most popular animated feature film before "Frozen" - and possibly after "Frozen," too. 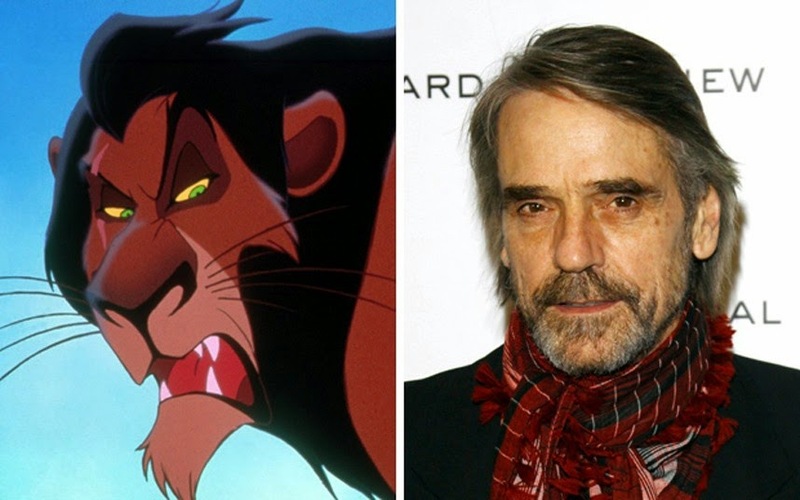 Jeremy Irons isn't usually thought of as a voice actor, but he made a deep impression as Uncle Scar in "The Lion King." Along with the other legendary characters in the film, Irons was a key part of an ensemble that still resonates with viewers today. Illene Woods began her starry career early, with her own radio show on the ABC network aged just 14. She also performed as part of the United States Air Force Orchestra during the Second World War and sang for two US Presidents – Franklin D Roosevelt and Harry S Truman. After performing "Bibbidi-Bobbidi-Boo", "A Dream Is a Wish Your Heart Makes", and "So This is Love" for her songwriter friends Mack David and Jerry Livingston, she was invited by Walt Disney to voice the leading role in Cinderella in 1950. By this time Disney had actually begun crediting its voice stars rather than keeping their identities a secret. 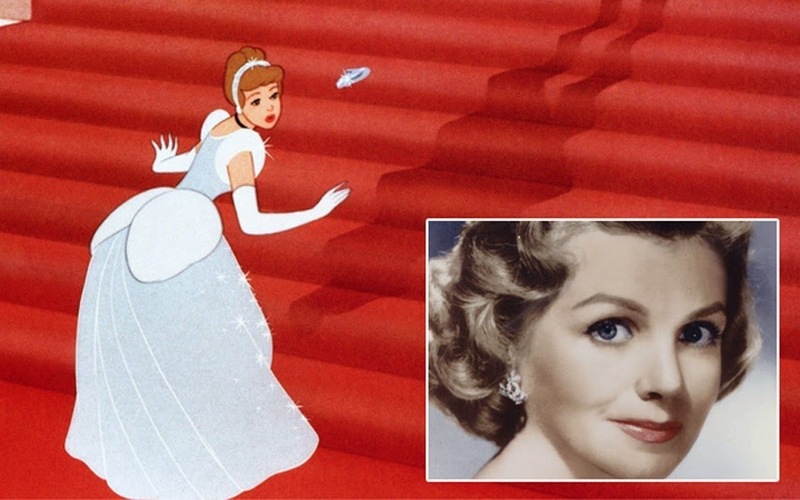 Illene Woods only voiced the one role of Cinderella - but what a role it was! Comedian Verna Felton was one of the true stars of Disney. She was already a regular film, television and radio actress when she was cast in her first Disney film as Mrs Jumbo in Dumbo (top right). 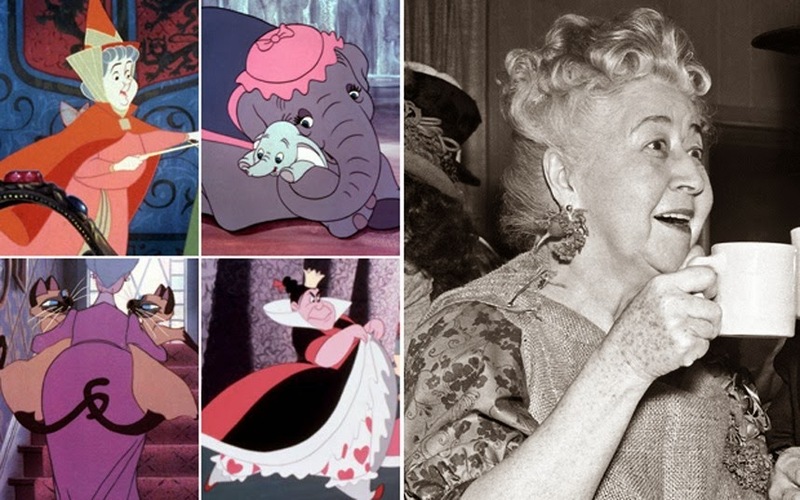 She went on to play the Fairy Godmother in Cinderella, the Queen of Hearts in Alice in Wonderland (bottom right), Flora in Sleeping Beauty (top left), Winifred the Elephant in The Jungle Book and mean Siamese cat-owning Aunt Sarah in Lady and the Tramp (bottom left). Late on December 14, 1966 she died of a stroke, aged 76. Just hours later Walt Disney himself passed away. You may not know who voiced her - but I can pretty much guarantee that if you have seen the original "Cinderella" that you remember the role of the Fairy Godmother. Well, Verna Felton voiced that and many other wonderful characters for Walt Disney. Lucille La Verne had had an extensive stage career before she was cast as the voice of the evil queen in Snow White. She was also a model for the artists creating the old crone – who the queen turns into to trick Snow White into biting into the apple. She retired immediately afterwards and opened a successful nightclub before dying of cancer in 1945. 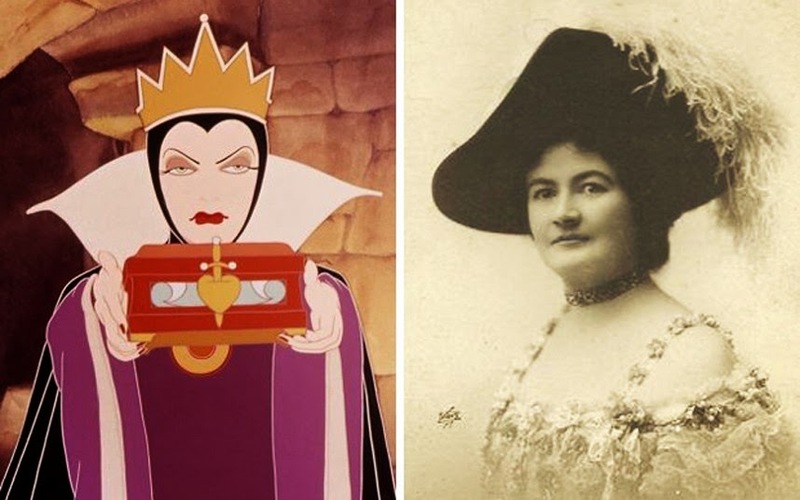 The Evil Queen in "Snow White and the Seven Dwarfs" may have been evil, but she remains one of the enduring figures in animated film history. She was voiced by Lucille La Verne, who was cool with not getting any official credit and used her fifteen minutes of fame to leave the business entirely and open a nightclub. It may have been the smartest career choice of anyone on this list. 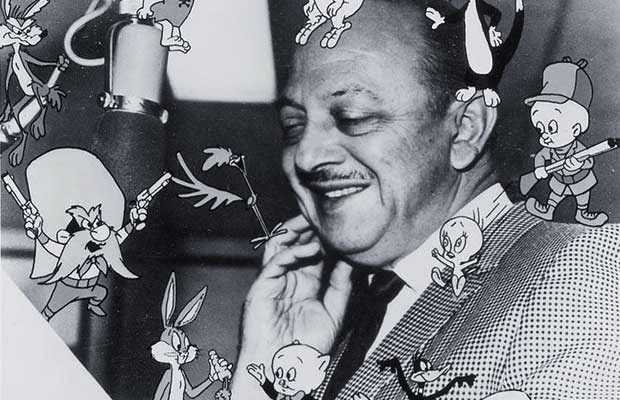 Mel Blanc is not only the voice of Bugs Bunny but also of Barney Rubble (and other characters in "The Flintstones" such as Dino), Daffy Duck, Porky Pig, Sylvester the Cat, Tweety Bird, Foghorn Leghorn and Yosemite Sam. Late in his life, he was the little robot Twiki in "Buck Rogers in the 25th Century." He did the car sounds in the Jack Benny radio show, and was highly insulted when the producers suggested that they simply tape the effects since it was the same sound every single week for years. "Don't you think I can do it?" he asked. He could - and he did. Not only that, he made the sound different every single time. There's nothing I can add to that. It speaks for itself. Nothing I could possibly write would do this bona fide legend justice. The character that is still, to this day, synonymous with Disney. 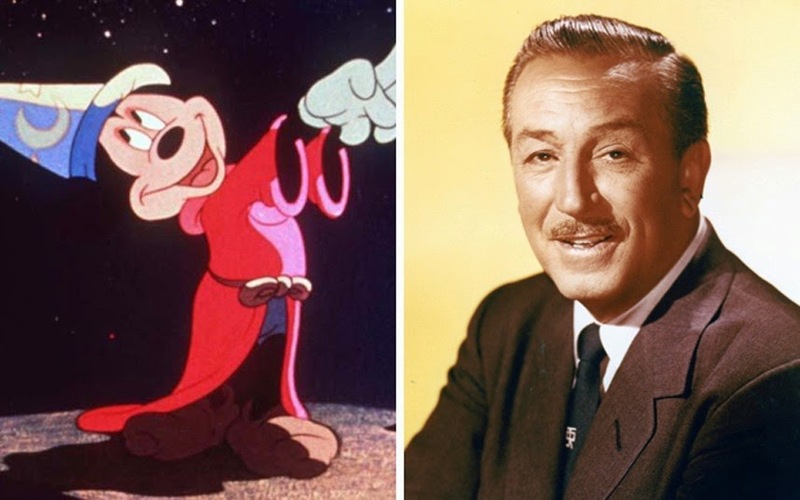 Mickey Mouse’s high falsetto voice was provided by Walt Disney himself for almost 20 years, including classic "Fantasia." However by 1946 he had become too busy to continue – and rumour has it his smoker’s voice was no longer up to hitting the high notes – so the role passed to Jimmy MacDonald. Awww, you did not really think we were going to give the master himself, Walt Disney, such short shrift, did you?